The newly renovated Hashemite Plaza in Amman Jordan covers about 50,000 square meters. It's one of the city's most prominent gathering places with lots of open space, and beautiful fountains, a few pretty gardens, and surrounded by eateries. It's also the location of annual events like the Aman Book Festival. Is surrounded on three sides by major Roman monuments including the Amphitheatre, the Odeon and the Nymphaeum. Directly in front of the plaza is the citadel monument. But what you should really check out is the hashemite plaza Park to the east. It's a nice place to stroll. How popular is The Hashemite Plaza? 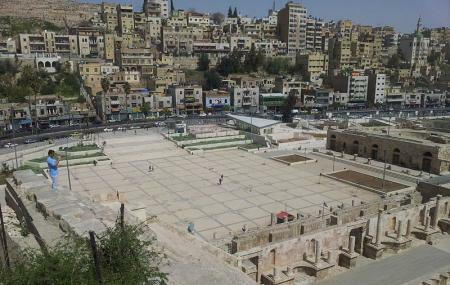 People normally club together Roman Nymphaeum Amman and Abu Darwish Mosque while planning their visit to The Hashemite Plaza. The plaza is an outdoor open space that has fountains, gardens, seated areas and cafe. It works as an entrance to two of the most popular ruins in Amman, the Roman theater and the Odeon. From the plaza you can find a tickets shop to get tickets to visit the amphitheater. From the plaza you can overlook the downtown of Amman, and the citadel which locates in a very short distance from the plaza. Parking lot is available. Free entrance to the plaza. You can enjoy it at mornings or afternoon, but make sure to plan your visit at the theater opening hours. Beautiful square in front of the amphitheater. Bring some snacks with you, order some shisha and do some of the best people watching in town. Also an amazing sight to see during Ramadan, hundreds families joined together to break fast. Super awesome and unbelievable palce👍, now a days they have renovated bit new look given and was good. Surrounding area is good and for roaming and a simple walk nice street food. It's the long legends & story of the downtown since the Roman empire's .. YOU can be with your family-friendly place Try to have that in place for your open-minded & open-sky location in down towns area... It's the Roman theatre in that open yard ... It's healthful to finde some of local families are breathing their.